The warmer days, the gentle sunshine, the spring flowers, the softness of new leaves, the purity of green colours and blue skies, the freshness of the spring air. 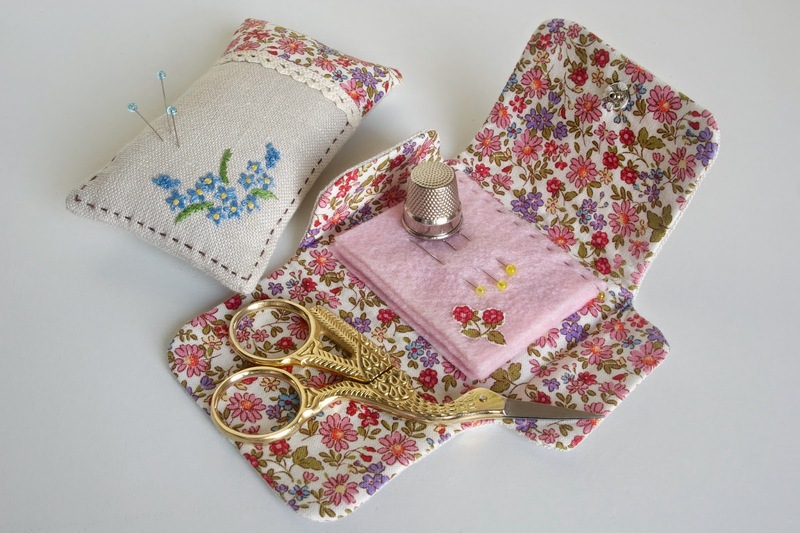 Those were all the little things that influenced this delicate sewing set. 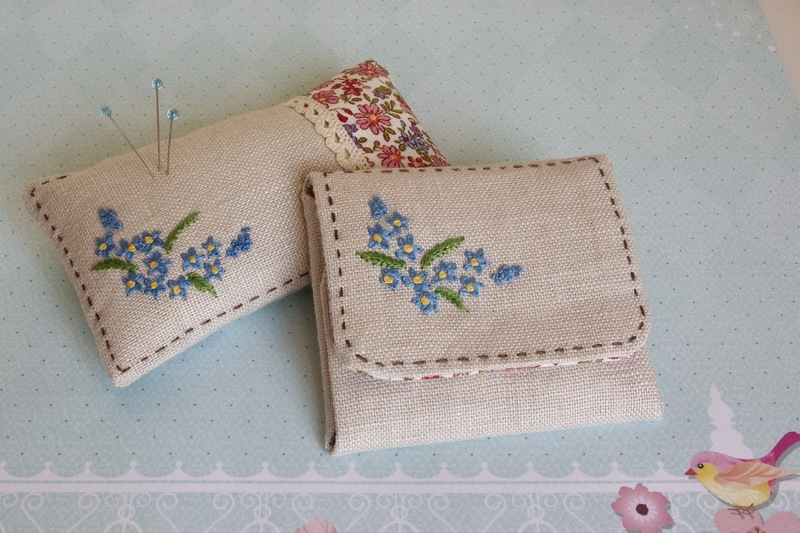 A needle case and a pincushion. 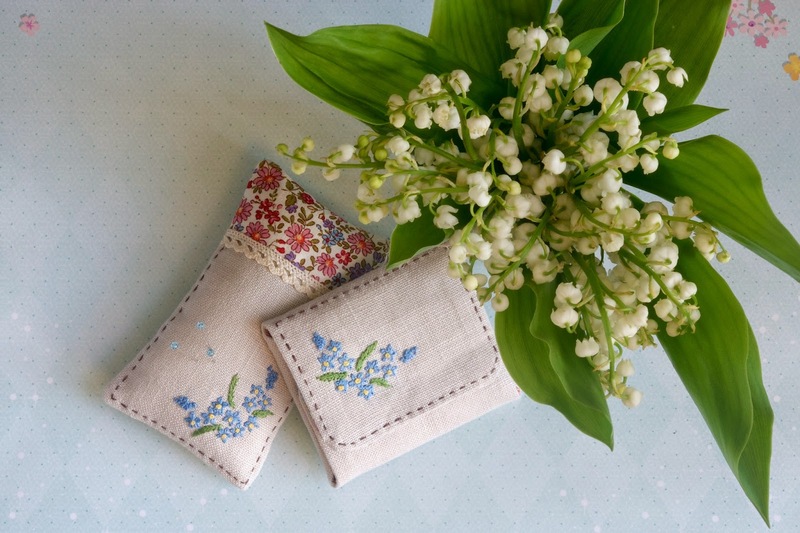 Shy forget-me-nots look lovely on linen in stone colour. Simple embroidery without any patterns, stitch by stitch just for the enjoyment. A bit of running stitch around the edge in a soft shade of brown. 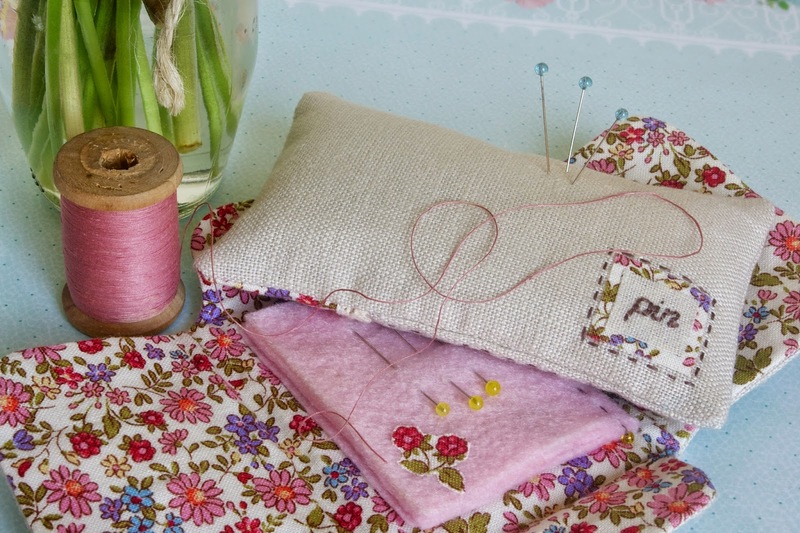 What a lovely splash of colour inside the foldable needle case that has four felt pages for the needles and pins. This pretty cotton was bought on eBay and I don't even know the name of it, it came in a pack, but it's so lovely. Each felt page has been beautified just a tiny bit with iron on flowers or lace or beards. 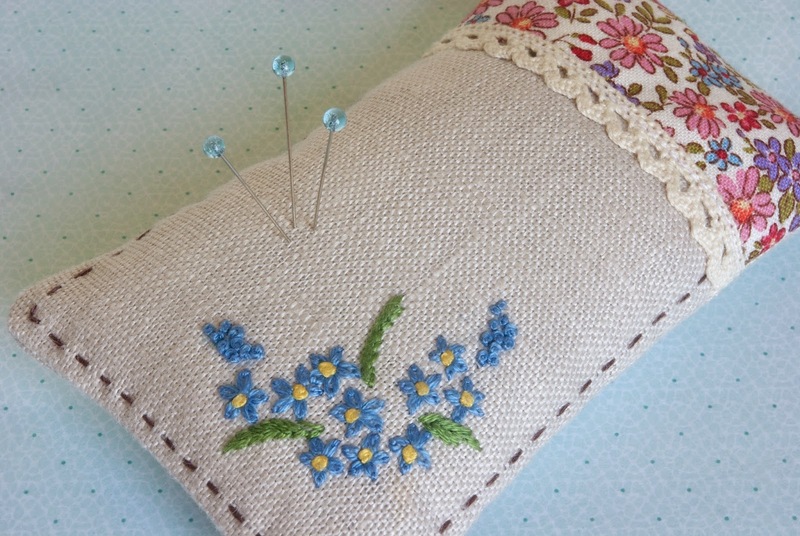 I am very excited about the pincushion because this time I filled it not only with soft fill but also with some glass pellets that made it heavy enough not to slide on the table when being pinned and pricked. I am looking for some ground walnut shells or emery sand for filling my pincushions. It's available on the internet but not locally, so maybe it's time to do some online shopping. These are the smallest labels I have ever made I think. 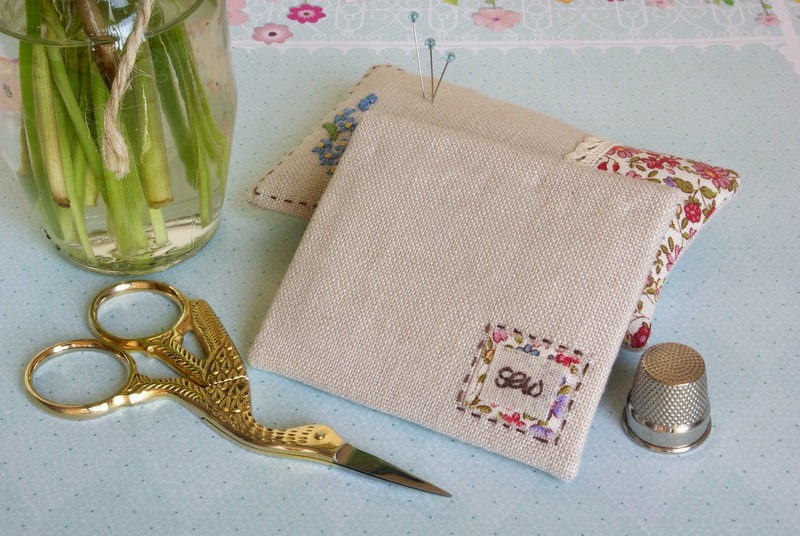 Pin & Sew embroidered on linen in teeny tiny letters. Nothing fancy, just two prints of fabric fused together and a bit of running stitch around it and Voilà! 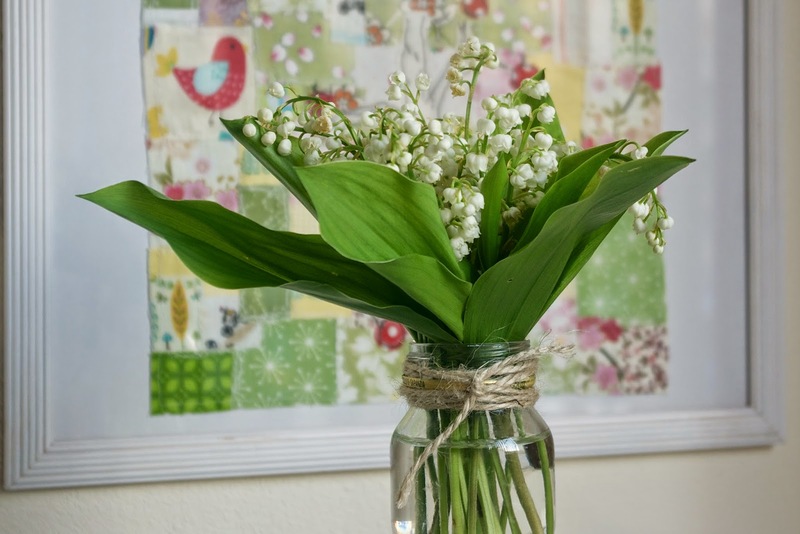 Today I am happy not only because of my newest creation but also because I was lucky enough to buy a small bunch of Lilies of the Valley - my ever so favourite flower that is sooo hard to find in Australia. I can't keep away from the beautiful white pearls hidden among green leaves and keep smelling it over and over again. I am carrying the jar with me around the house. :-) It's the best scent ever! Gorgeous set Larissa and perfect little stitches! I love the flap closure of the needlebook and the floral print is so pretty!! 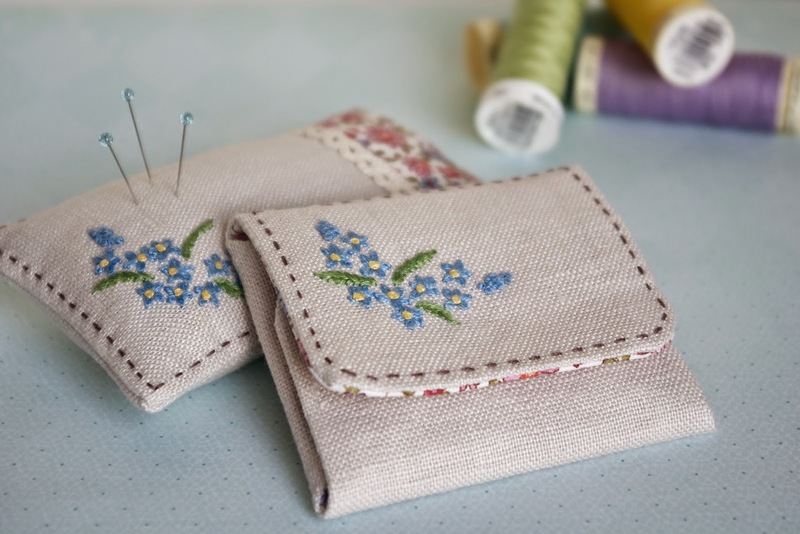 I think they are the prettiest needle book and pin cushion i have ever seen. The last pin cushion i made I added crushed walnut shells as well as poly fill and i really like the weight it gives! Beautiful work Larisa!! The sewing kit is delightful, Larisa. I'm so pleased for you that you found some lily of the valley - enjoy them!